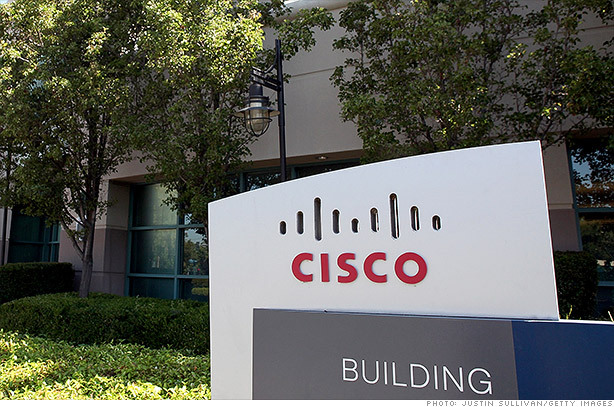 Shares of Cisco tumbled after an analyst slashed his price target and rating on the stock. "We expect it may take longer than management expects to create organic software growth that is able to offset declining core routing and switching revenues," said Thompson in his report. Cisco (CSCO) recently acknowledged that routers and switches still make up nearly half of its revenue but pointed to rapid growth from data center sales, wireless networking and online video services. But Thompson points out that Cisco's plan to generate $12 billion of software-based revenue over the next three to five years seems aggressive. He calls it a "REAL stretch-goal" that will be hard to achieve without a major acquisition. The Debbie Downer report pushed Cisco's stock down more than 4%, and gave StockTwits traders plenty to chew on. Thanks for sharing. The thing that stood out for me was a reminder about how much cash Cisco has on its balance sheet. Plus, the company has been buying back stock and issuing dividends. Those are all healthy signs. Haha. Well, I, unsurprisingly, say to wait. Without a crystal ball, it's way too much of a guessing game. As it evolves into other areas, Cisco faces stiff competition from the likes of IBM, Alcatel-Lucent (ALU) and Hitachi (HTHIY) to name a few. I can't imagine it's not looking at ways to knock one or more of them down a peg or two. Say it ain't so. Are we heading for a death cross? I like to end on a high note. As I noted higher up, Cisco does continue to pay a dividend and that usually sits pretty well with investors. Maybe Cisco is being too aggressive...but maybe this is also just a temporary setback.